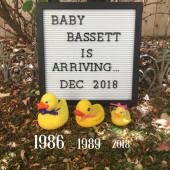 Steve and I are SO excited to be welcoming Baby Bassett into the world soon! We are beyond grateful for all the love and support from you...our dearest family and friends. Thank you thank you!